We have sleeveage! Ok, the start of sleeveage, anyway. I’ve decreased from 72 to 58 stitches on the first sleeve, and I need to get to 30 before I start the ribbing. I finished up the hem at the bottom a couple of days ago, and I’m very happy with how it came out. I think it will lay better after blocking, too. Since the sweater has gotten a bit unwieldy for taking to rehearsal, I decided to start the Boteh scarf as a more portable option. November 13th, 2008 | Tags: Crochet, Knitting, NaKniSweMo08, WIPs | Category: Misc. The sweater is looking great!! You mean Kris isn’t a fan of 3/4 sleeves? 🙂 You are making serious progress on that sweater. Very impressive. 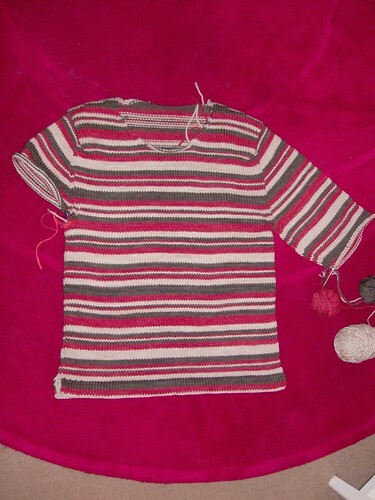 The hem on the sweater did turn out great and the colors on the Boteh are dispersing perfectly. It is only the 13th, I think you’ll make it. Looking good with the sweater!! Gosh, love the Boteh too, I need to brush up on my crocheting skillz before I attack that! God dang, you might actually get a man sweater done in a month! I’m highly impressed!! And I love the colors you’ve got for that Boteh! You will be done in no time sista! I think I added on 2 more triangles to the Boteh? The single crochet edging around the entire thing really eats up lots of yardage so keep that in mind! Isn’t Boteh an awesome pattern? Love it!